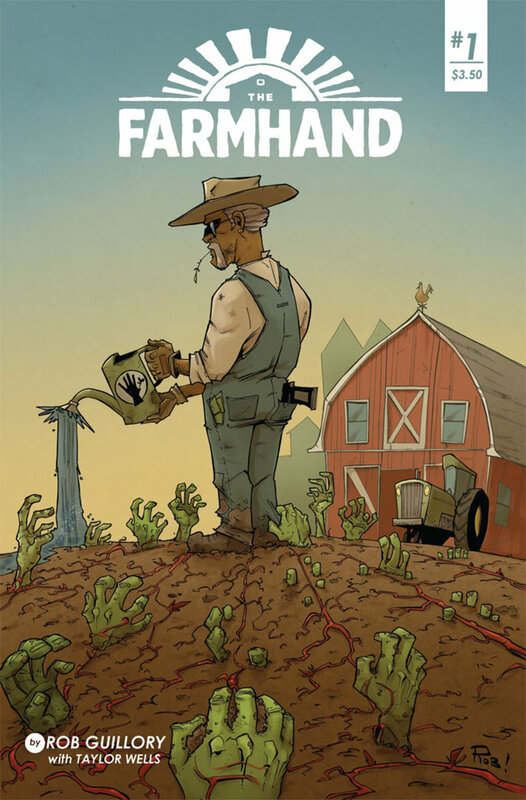 I am not sure what Rob Guillory was after with ‘The Farmhand’. There is a creep factor at play for sure as Jedidiah Jenkins a farmer, grows fast-healing human organs. When you need an eye, or an arm he harvests one off a plant and there you have a ready replacement. Of course nothing like that is ever as good as it seems, but what exactly is amiss is not fully clear after only one issue. There seems an element of horror here, but it comes off more like a Scooby Doo horror tale than a seriously dark and scary comic. The art fits Scooby Doo more closely too. The problem is the humour is pretty thin here. I momentarily thought Guillory might be going for a Sharknado feel, but it’s not quite that over-the-top, nor is it that funny either. The end result is a book that never seemed to gain any traction through issue one. The characters are neither particularly likeable, nor are they wholly despicable either. They come off as bland, much like the story. The art is excellent, although whether it fully suits the story is hard to tell because the story lacks focus to know what the writer wants it to be.